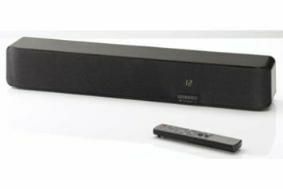 Denon upgrades its Surround Bar with 'virtual sub' technology | What Hi-Fi? And the new model, the DHT-FS5, doesn't need to be used with an add-on subwoofer: it's equipped with 'virtual subwoofer' technology as well four surround modes, meaning you can further reduce the number of wire required. The new model is optimised for use with 24in to 37in screens, and has three digital inputs and one analogue audio, allowing a wide range of components to be connected up. It can even handle music from an iPod, wi-fi or internet radio using Denon's optional ASD-3W adaptor. The DHT-FS5 can be used on an equipment rack or wall-mounted using the brackets supplied. It decodes Dolby Digital/Pro-Logic II and DTS, and its X-Space Surround system has movie, music, stereo and news sound modes. There's also a 'Night Mode' for late-evening viewing. It has a Quick Set-up Guide and simple presets designed to make it easy for all the family to operate, there's a remote control, and the whole thing is designed to be as simple as possible to install and use. The unit uses a triple bass-reflex design (see below), said to give a deep, clean bass, and uses a total of six 8cm drivers powerd by 4x25W amplification plus an additional 50W for the bass. It measures 75cm wide and stands just under 12cm tall.